PROVIDENCE – Five Rhode Island companies have received Innovation Voucher grants from R.I. Commerce Corp., allowing them to partner with research and development centers at universities, medical centers or research facilities. The companies, which have fewer than 500 employees, were among 31 applicants for the latest round of Innovation Voucher funds. The incentive is designed to allow small companies, which do not have their own research and development capacity, to pair with universities, medical or research centers. Awarded on Monday, the grants in total are worth $246,302. FS Maritime LLC will use the University of Rhode Island's expertise in environmental hydrology and civil engineering to complete validation testing of a prototype of its Precise Energy Separation water treatment device. The device generates light waves that destroy a range of pollutants in water, according to a Commerce RI announcement. The company will receive a $50,000 grant. Phoenix Medical Technologies LLC will work with a renowned brain stimulation expert at Bradley Hospital to collect clinical data and other information for the development and commercialization of its medical device. The device uses sensory stimuli to non-invasively treat ADHD symptoms, as well as those of other conditions, according to the news release. The business has received a $50,000 grant. Prisere LLC will work with the Architecture Department at Rhode Island School of Design to quantify and refine the outcomes of high-performance building technology for climate-resilient design. The information will be used to inform insurance underwriting and pricing models that will benefit small businesses and other companies that take steps to incorporate climate resilience in construction, according to Commerce RI. The company will receive a $50,000 voucher. 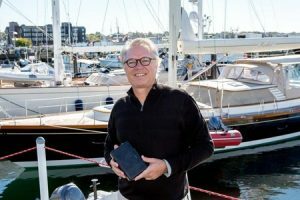 Siren Marine LLC will work with the New England Institute of Technology to develop a wireless transceiver and sensors for the Siren Marine Internet of Things cellular gateway. This technology is designed to improve the company's existing technology and expand its system for use beyond the marine industry. The company will receive a $50,000 grant. Xmark Labs LLC will work with the Gait Lab at the Providence Veterans Administration medical center to develop a low-cost, low-latency tracking technology for virtual reality and augmented reality applications. The funds will allow the company to access equipment and expertise in locational tracking and analysis. The company will receive a $46,302 grant.